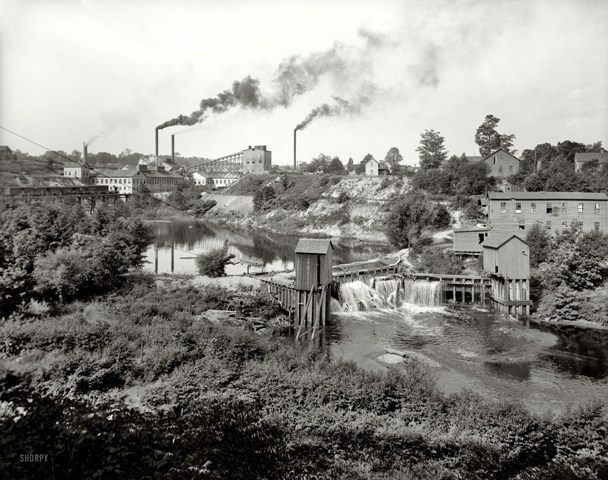 Paper mills around the Bear River, circa 1908. Today, the area photographed above is near Petoskey’s City Hall/fire station at the mouth of the Bear River where it empties into Lake Michigan. “Emmet County is at the top of the Michigan mitten. Its northern tip bumps into the Straits of Mackinac, and Lake Michigan outlines its western boundary. At first, Ottawa Indians occupied the lakeshore rim. Beyond the water’s edge there were only the forest, the lakes, the streams, and some swamps dismal enough to discourage a traveling bear. Its strategic location on the Great Lakes waterways, however, marked it for early discovery by white men and the point of control for the whole upper Great Lakes territory. By the time Michigan became a state, well over one hundred years of fur trading, war-making, and empire-building history was already behind it. “Recorded history for the Mackinaw area started about 1670. The French built Fort Michilimackinac on the Straits, at presentday Mackinaw City, around 1715. The history of the area revolved around this fort for the next 66 years (while Britain and France struggled to control the fur industry). “The Indian settlement on the western lakeshore rim of the county, however, continued to flourish. In 1840, the year Emmet achieved shape and form as a county of the State of Michigan, Indian villages were almost continuous along the shoreline from today’s Harbor Springs to Cross Village. The area was still a wilderness, and the Indians, by treaty provision with the U.S. Government, had the right to occupy the land. The county continued to be mostly Indian reservation until 1875. In that period of time it was used pretty much as a political football and went through numerous changes in shape and size. Indeed, the history of Emmet County must begin with the story of its first inhabitants, the Native Americans. The Odawa’s presence here dates back before records were kept, perhaps thousands of years and countless generations. In the early years, the tribe was known—and still is—as Anishnaabek, and the language is still known as Anishnaabemowin. The Odawa’s first recorded contact with Europeans occurred in 1615, with French traders. During those early years, relations between the Indians and French were mostly positive, with the natives helping establish fur trading throughout the entire Tip of the Mitt region—from Petoskey to Lake Huron near Alpena. The Odawas were known for their excellent canoe-making skills, with vessels able to haul large numbers of pelts around the Mackinaw region, and even as far as Montreal, to trade for European goods. This vibrant trading helped the European settlers and even some natives themselves become affluent. However, the natives would soon discover that the arrival of the Europeans brought diseases like smallpox, measles and cholera into the tribal communities. In addition, brutal wars with tribes who traveled from the East Coast to claim Michigan’s land also had a profound impact on the Odawa tribe, which started moving westward. 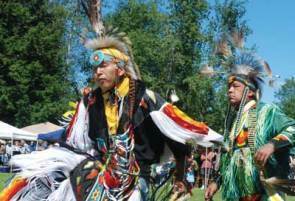 They slowly returned and in 1836, the first major treaty was signed that allowed them to stay on land in the Little Traverse Bay region for five years. A second treaty, in 1855, allowed the natives to stay on reservation land indefinitely. Integral in the negotiations was tribal leader Andrew J. Blackbird, whose original house in Harbor Springs is now a museum. In the late 1800s, the tribe lost its federal recognition status and the Little Traverse Odawa fought continually until their status was restored in 1994. 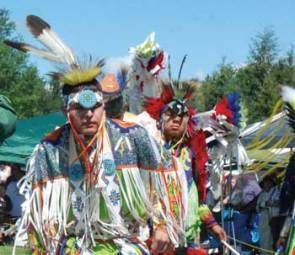 This gave the Odawa descendents a renewed spirit to keep the native culture alive in tangible and important ways. Significantly, the federal recognition ushered the opportunity to reclaim reservation lands, to exercise their right to operate as a sovereign, and to open a casino in Emmet County. Eric Hemenway, the Odawa’s research repatriation assistant, says the fact that the tribe remains strong and viable today is a testament to its people. “The most remarkable thing is that there is still a population today; there are still Odawas,” says Hemenway about his tribe’s legacy. “We still have our identity as Odawa people—our customs, our language, our aboriginal territory.” Notably, spirituality continues to be an integral part of life, and respect for elders remains a cornerstone of the Odawa familial ties. The elders, Hemenway explains, passed along hunting and survival skills, and cultural teachings to younger members. And while the casino is perhaps one of the most visible parts of the tribe’s presence, Odawas like Hemenway find it more accurately depicted in traditions like ghost suppers, quillwork artisans, respectful and proper burials of members, and renewed interest in teaching the native language. In fact, Harbor Springs is the only public school in Michigan to offer a native language class in Anishnaabemowin. Further historical documents culled from various sources note that the first white settlers who came in the 1820’s were fishermen, and growth of the county was expedited when the Grand Rapids & Indiana Railroad began serving Petoskey in the mid-1800s. While the soil was poor, the lumbering was good. At the height of the lumbering era, the resort industry grew. Resorters began traveling northward to escape allergies and the summer heat, and the train stations were busy with passengers arriving aboard the Resort Express routes. The first established resort was Bay View, founded in 1875 by the United Methodist Church. Bay View is a National Historic Landmark community which is home to more than 30 community-owned buildings, nearly 450 cottages and two inns situated on 337 terraced acres just outside Petoskey along the Little Traverse Bay shoreline. Generations of families still come to their Victorian cottages each summer, swelling the local population. The community hosts public music events, worship, lectures and educational seminars. Bay View was followed by the Harbor Springs resort communities of Harbor Point and Wequetonsing, exclusive acres of storied homes and waterfront parcels. Other visitors stayed in a series of increasingly elegant hotels. Today, many resorters have become fulltime residents, drawn by the natural beauty, the lively economies, and the still-abundant charm of Emmet County’s towns and villages. The July 2, 1965 issue of Time magazine featured the “Best Resorts – Summer in the U.S.A.” and it included Harbor Springs and Harbor Point, Charlevoix, Petoskey and Wequetonsing. As it does today, Northwest Michigan communities join the ranks of other notable areas for resorting include Cape Cod, Colorado Springs and the Hamptons.